Seit einigen Jahren halte ich eine Sturisoma-Art, die mir unter St. aureum verkauft worden ist, die aber kleiner als S. aureum bleibt (ca. halb so groß) und daher für mich bisher als unbestimmte Art gilt. Fortpflanzung und Larvenaufzucht laufen wie bei anderen Arten der Gattung ab. Der Schlupf war also schon am laufen und ich konnte auch schon einzelne Sturisoma-Larven mit dickem Dottersack an den Scheiben und Wasserpflanzen kleben sehen. Ich habe die Larven in einen Einhängekasten überführt und die noch nicht geschlüpften durch die Absaugmethode ebenfalls dorthin gebracht. Nachdem immer so viele Sturisomalarven nach und nach aus unerfindlichen Gründen sterben, versuche ich das ab heute mal mit steriler Aufzucht im Tuppa-Gefäß mit späterem Mulmzusatz. Heute habe ich erstmal ca. 70 Larven aus ihrer Eitraube "geerntet". Bild 1 und 2: Aufgefangene Larven sammeln sich am unteren Rand des Gefäßes. Die leeren Eihüllen sind noch sichtbar. Bisher sind alle Aufzuchtversuche gescheitert! Ich weiß langsam nicht mehr weiter..... Heute setze ich erneut einen Aufzuchtversuch in einer Plastikwanne an. zwecklos, alle Larven starben nach ca. 2 Wochen ohne erkennbare Nahrungsaufnahme. Durchlüftung hält das Wasser in Bewegung und wird später auch das Futter herumwirbeln. Hier wird das Wasser durch die Drossel der Lampe der Aquariumabdeckung darunter erwärmt. Ich bin gerade im soundsovielten Versuch. Diesmal hängt ein Netzkasten im Becken der Eltern und wird stark von unten durchströmt. Angeboten habe ich HikariAlgaeWafers, Sera Welstabs, Fluckenfutter und Spirulinaflocken. Nach einem Tag ist das Futter dann weg, aber vermutlich durch die Arbeit der TDS. Zu den Sturisoma-Larven habe ich jetzt noch eine Handvoll trockene Brennesseln getan. Was soll ich sagen - man soll's ja nicht beschreien - aber ich habe den Eindruck, dass die Larven mit dicken Bäuchen herumschwimmen und auch schon gewachsen sind! Die Brennesseln, das andere Laub, das Aufwachsen im Becken der Eltern usw. Ja, sie wachsen und wachsen - man kann es fast beobachten! Da habe ich nochmal Glück gehabt, denn die Alttiere haben langsam ihr Lebensende erreicht. Es sind jetzt nur noch drei Elterntiere vorhanden, davon ein Weibchen. Aber der Nachwuchs besteht aus ca 30 strammen Kerlchen! Hier ein paar Bilder der F 1 in unterschiedlichen Entwicklungsstufen. 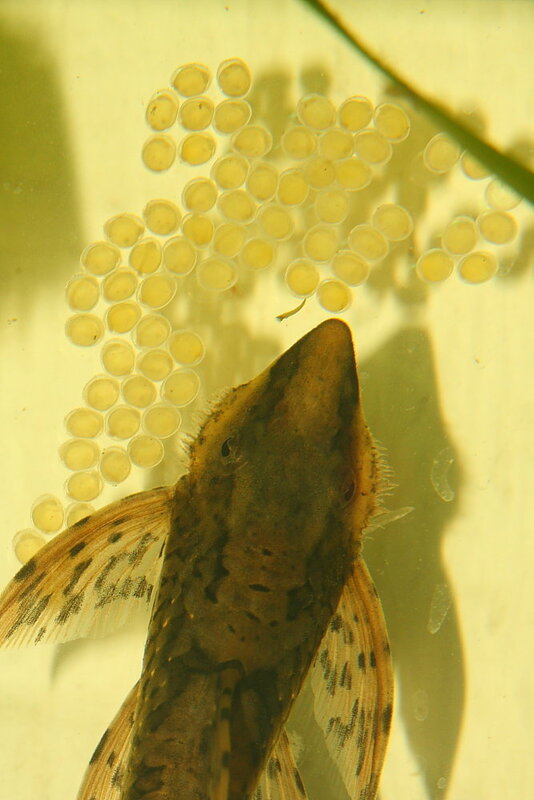 "Successful breeding of the more commonly imported Sturisoma spp is a fairly common event, and observing their breeding and brood care behavior is a fascinating experience. 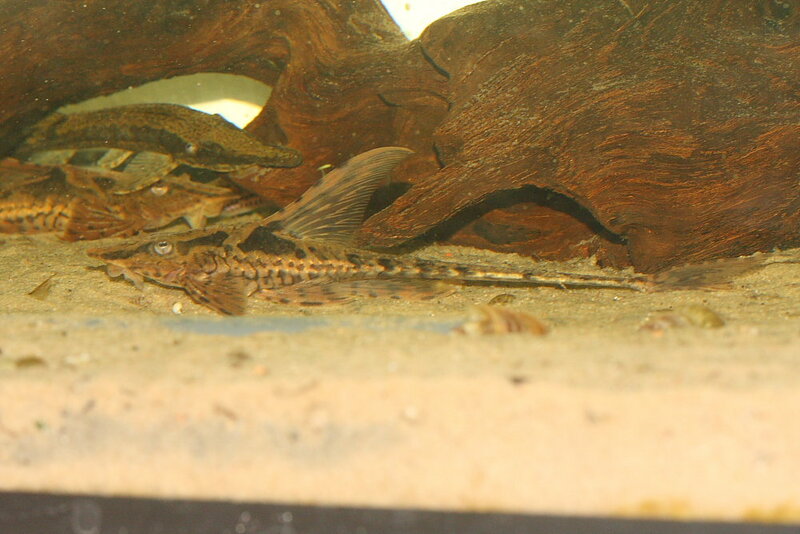 The spawning may be planned, but more often the fish spawn quite unexpectedly (for the aquarist anyway). 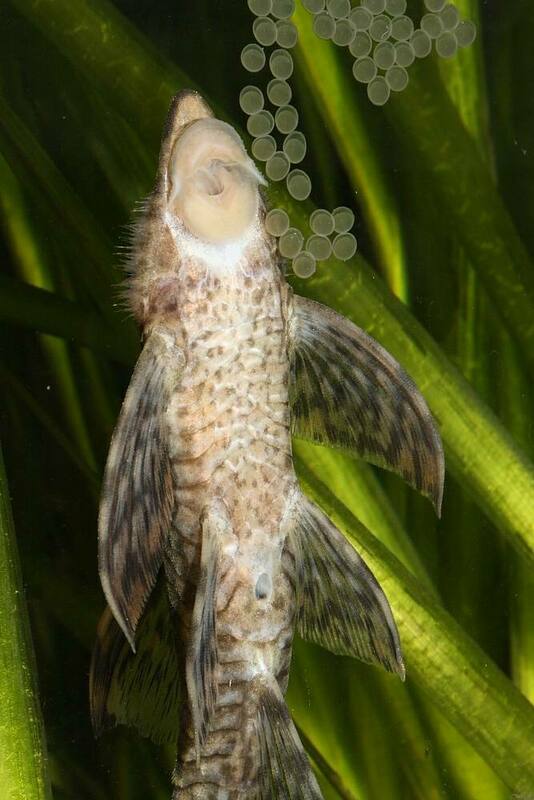 In such an instance aquarists find them quite unprepared for the hard part - raising the fry. 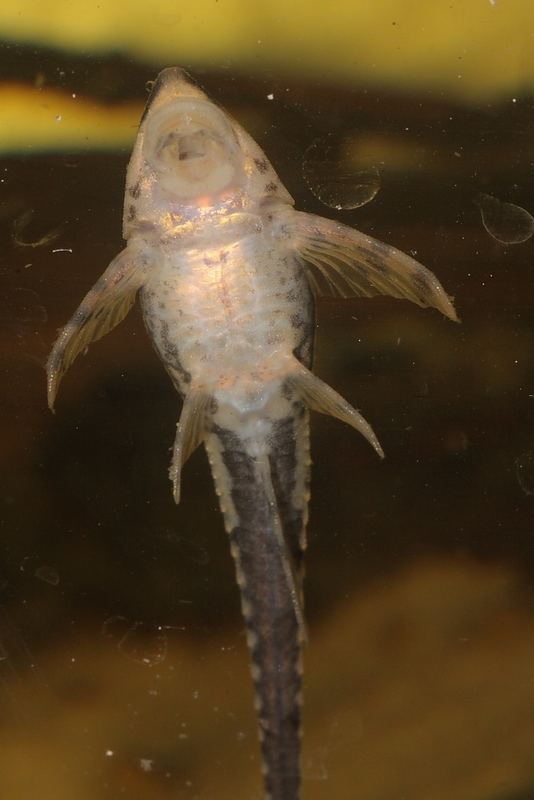 Below, I share my methods for raising Sturisoma fry and try to provide the reasoning for my techniques as they are different from most methods I have come across in the literature. 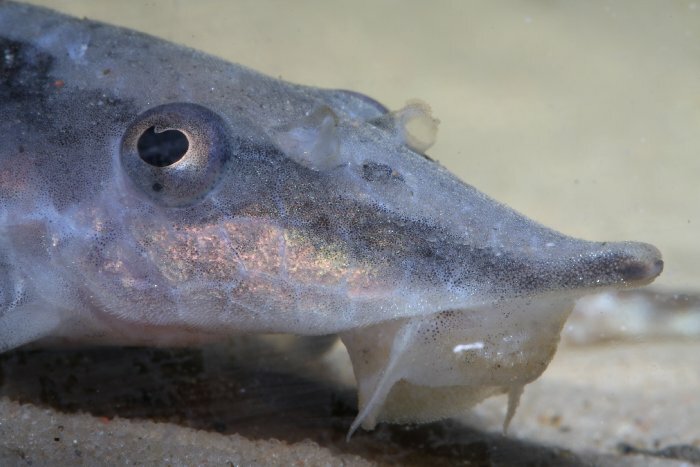 In personal communications with Ed Ruiz, my Venezuelan friend who has frequently collected Sturisoma, I have learned the following about the breeding habitat of Sturisoma spp he has collected. In Venezuela they are commonly called “policias” due to the males’ habit of standing guard upright as if at attention on their nests. 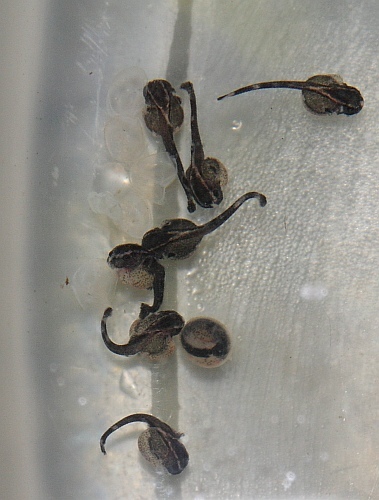 Ed has observed them spawning in the shallow riffles of small streams in water normally about 12 to 24 inches deep. 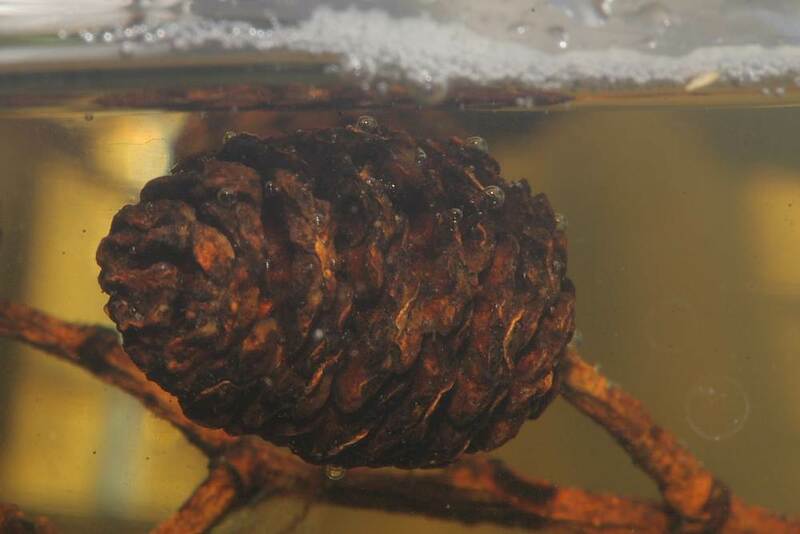 They typically spawn on an exposed root or slender piece of submerged wood. I have been a lifelong fly fisherman and fly tier and have a good grasp of aquatic biota as an amateur aquatic insect entomologist. I researched the subject of neotropical aquatic insects and found they were well represented with species analogous to those I have encountered in rivers, streams, and lakes in North America. 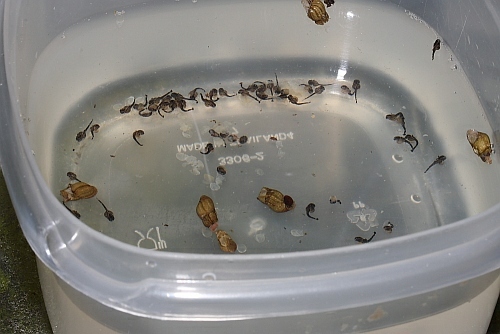 The richest natural habitat of most aquatic insect larvae is well oxygenated and will have swift water. 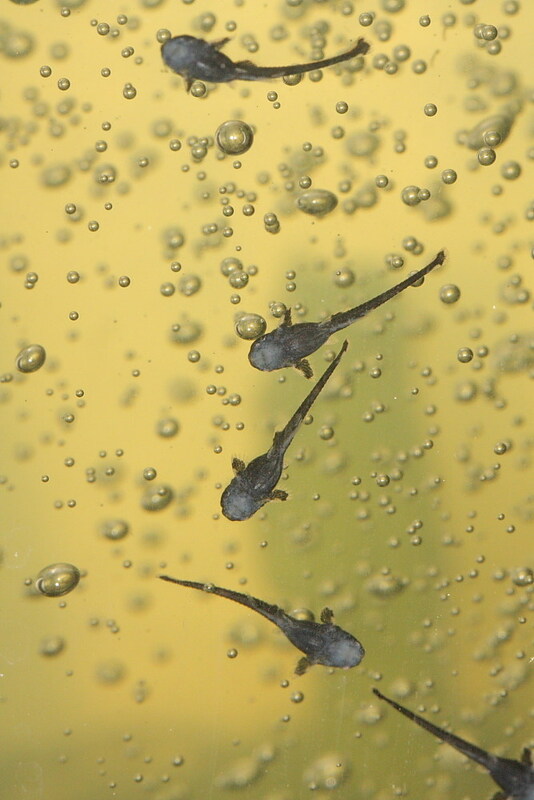 Therefore, I try to simulate these conditions in my Sturisoma spawning rearing tanks. The insects present include, but are not limited to, caddis flies, stone flies, may flies, and black flies. All of these aquatic insect larvae live on and in the periphyton layer of algae growing on rocks, wood, and sand. My aquarium observations verified that Sturisoma are primarily predators of aquatic insect larvae and that the algae they eat is somewhat incidental to their search for the insect larvae living in periphyton. I think that the fry of Sturisoma eat the same foods, but due to their smaller size, would tend to eat the egg masses and newly hatched aquatic insects. This is an important distinction because most aquarists consider Sturisoma spp to be algae eaters. They are... but only as a byproduct of their search for small aquatic insect larvae. Many hobbyists try to feed Sturisoma fry a variety of algae substitutes only to see the fry starve in large numbers. 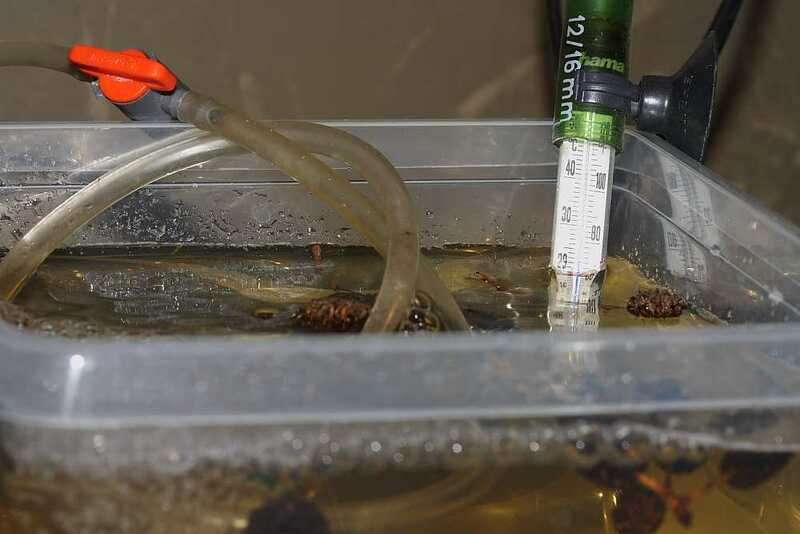 It isn’t easy to supply aquarium bred fish fry with the same foods they would normally exploit in their native waters, so we aquarists have little choice but to search for acceptable substitutes. 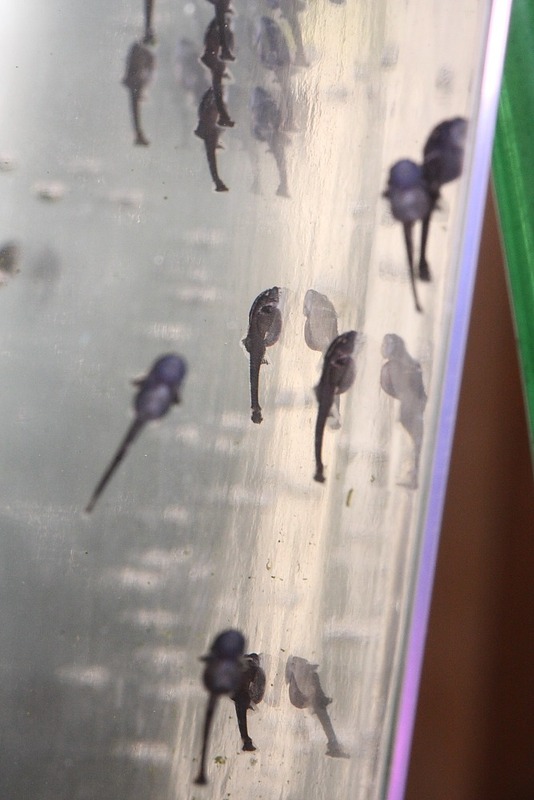 My choice of substitute foods for Sturisoma fry lead to experimentation with two foods used in commercial aquaculture for the conditioning of breeding stock. I have found that two foods work very well as the primary diet for Sturisoma adults and fry. 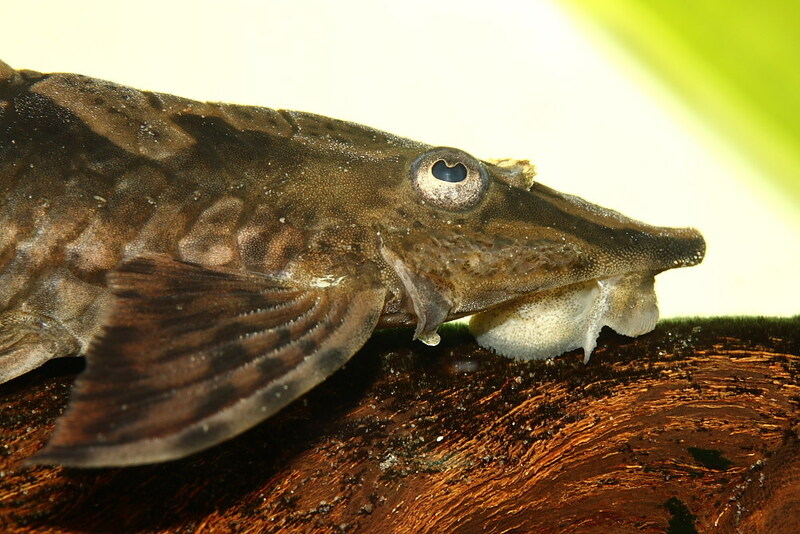 Indeed, these foods have proven indispensable for me in breeding and raising many species of loricariid catfish. The two foods are earth worm and Spirulina sticks. The Spirulina sticks are not simply an algae-based food but also incorporate a high percentage of shrimp meal. The earth worm sticks also contain shrimp meal. Why is the shrimp meal important? The exoskeletons of all aquatic insect larvae are composed of the protein, chitin. Chiton is rich in calcium and is a building block in the formation of bone and scutes of all armored catfish. It is also a source of roughage important in proper digestion of foods. Between these two foods, one can provide a fairly well balanced diet for Sturisoma fry. You can actually forget about the use of garden vegetables entirely. 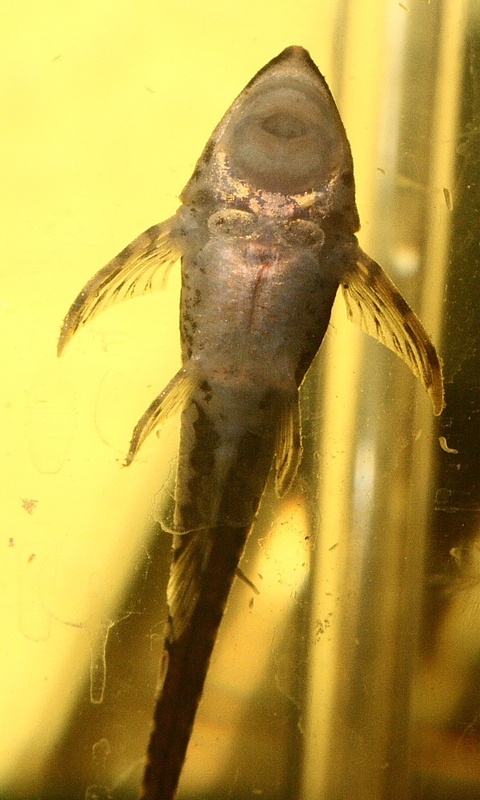 Once wild Sturisoma fry hatch, they leave the deeper water where the nests were. 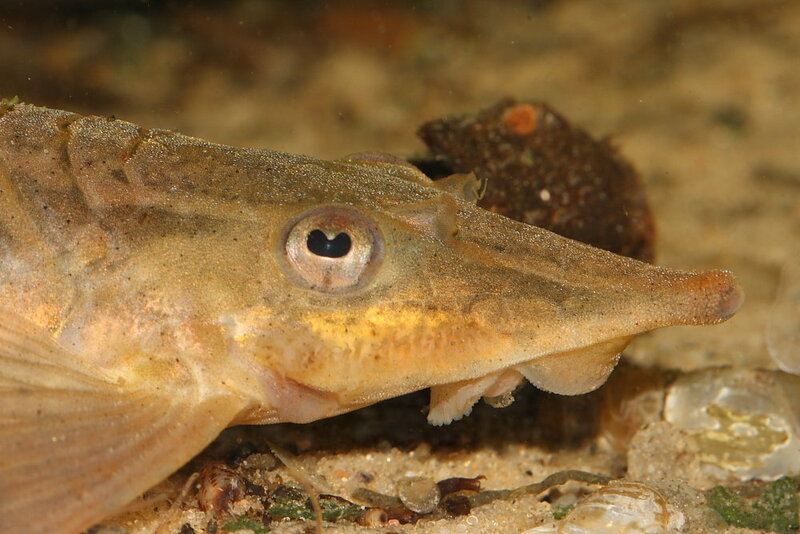 It is my opinion that the fry move down stream to the rocky tail outs of the riffled pools where the adults chose to spawn. This water is only 6 to 12 inches deep. 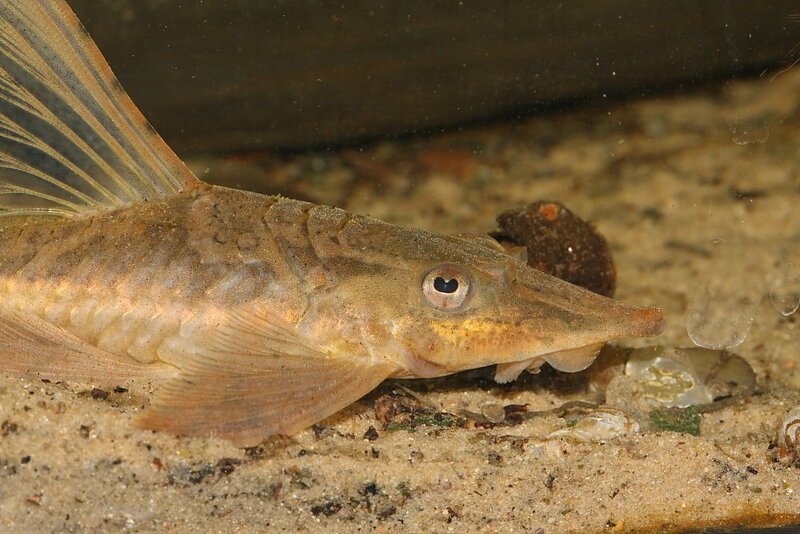 The fry are naturally strong swimmers but they take advantage of the phenomena common to all fast water fish living over a rocky bottom called the “boundary effect.” The boundary effect is when the turbulence of the fast water just above the rocky bottom creates a thin zone of relatively slow water. In the case of the zone where I believe newly hatched Sturisoma fry likely inhabit the zone is only an inch or so thick. It is a place where aquatic organisms have all the benefits of fast water such as high dissolved oxygen levels yet can maintain themselves in this food rich zone with the minimum amount of effort. This preserves their strength to avoid predation or leave in search of fresh feeding grounds. 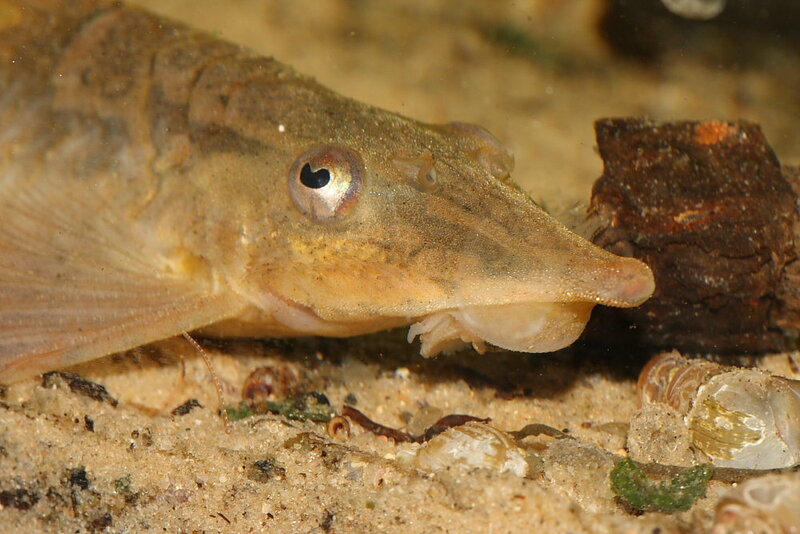 As the fry grow, this ability can be exploited to utilize ever deeper waters. 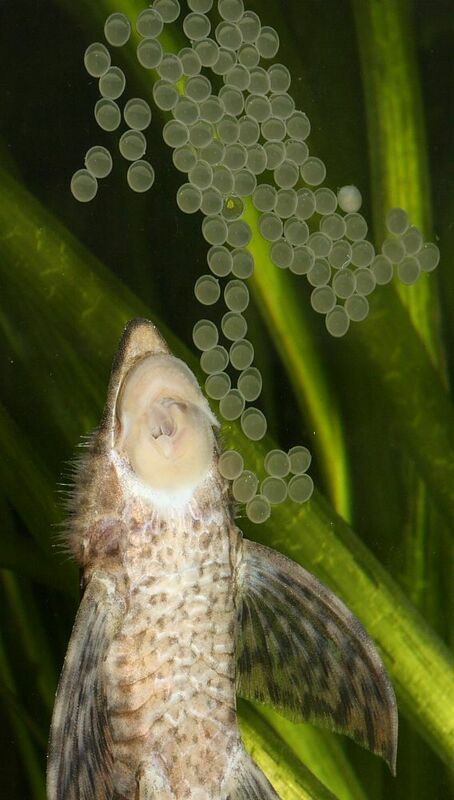 This is an important concept that one must always keep in mind when raising Sturisoma fry. 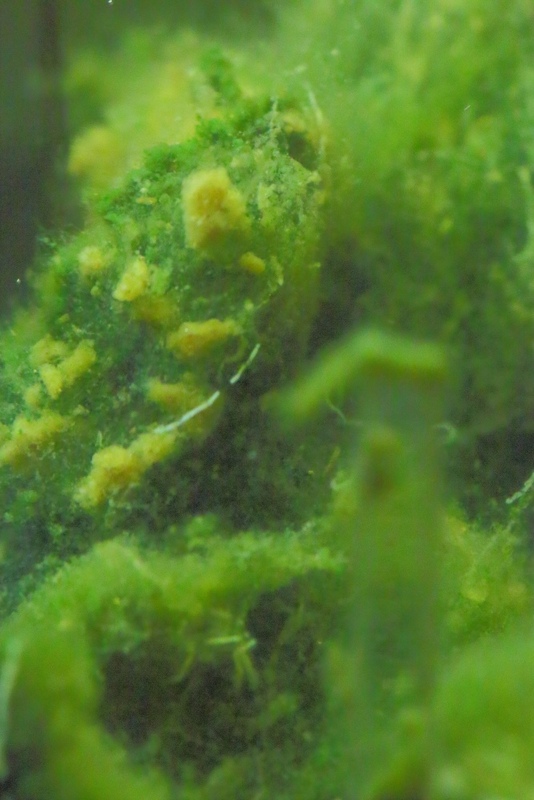 These are conditions that we must strive to duplicate in the aquarium to raise our Sturisoma fry but we must keep in mind that what is ideal changes as the fry grow and ultimately mature. 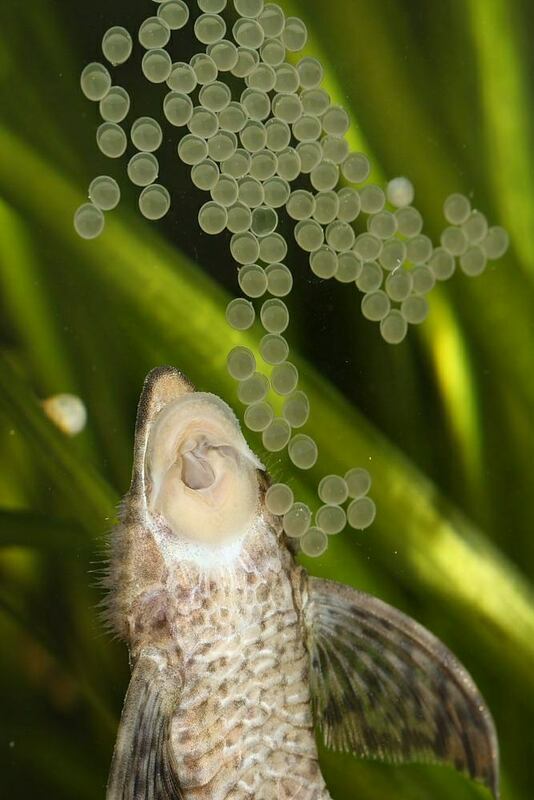 It can also be one of the most difficult aspects of creating the correct environment in the aquarium for the fry as they develop. 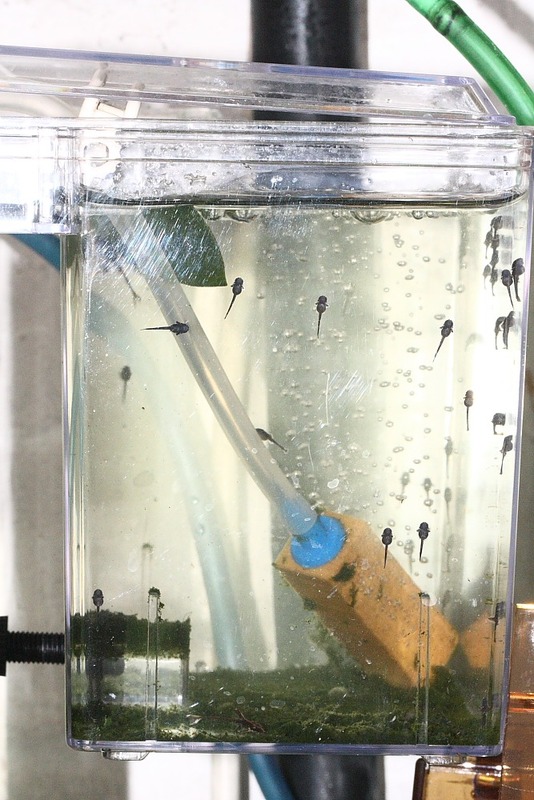 Recreating a suitable aquarium environment for Sturisoma fry at every stage of their development is an art based on some science. Finding exactly works best for you will require experimentation. I can only share the techniques I have used with success. 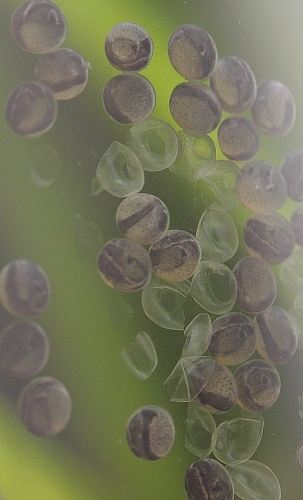 I prefer to remove the Sturisoma eggs from a glass substrate or trim a stem or leaf they have placed their eggs on rather than trying to collect them by netting and perhaps risking harming the fry. When the eggs are laid on the glass I remove them at 8 days by using a razor blade scraper and small diameter siphon so I can catch any eggs that fail to adhere to the edge of the blade. I have always breed my Sturisoma at 84*F and find they generally hatch on day eight. 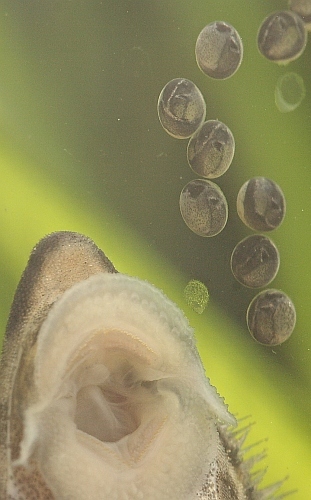 Most unhatched eggs will hatch in the reduced pressure they encounter going through the siphon hose. 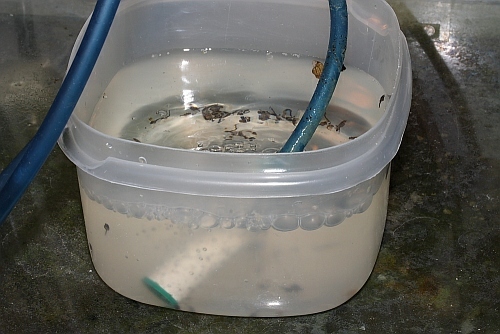 I place a net breeder in a bucket and siphon the fry and prehatched eggs into the net breeder. I then hang the net breeder back in the breeding tank. I also place a plastic jar lid about 3-4 inches in diameter and weighed down by a couple of pebbles to form an area to hold food. I feed mostly by using a cheap filter media bag containing a small amount of earth worm sticks and the bag is also weighed down with a small pebble, however the bottom of the bag is kept within three inches of the water surface. Feeding newly hatched Sturisoma fry is not an immediate concern. 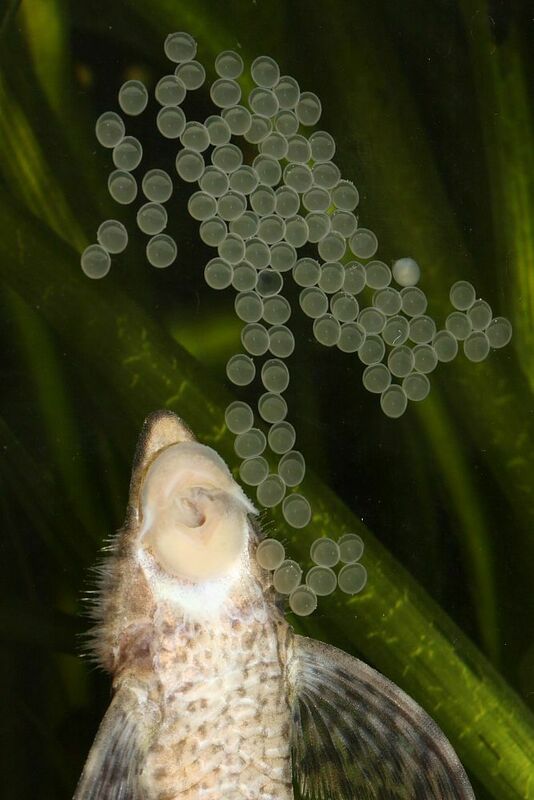 They hatch with enough yolk sac remaining for them to not need to begin feeding until approximately 48 hours have passed. Some fry may take 72 hours before they begin to eat. 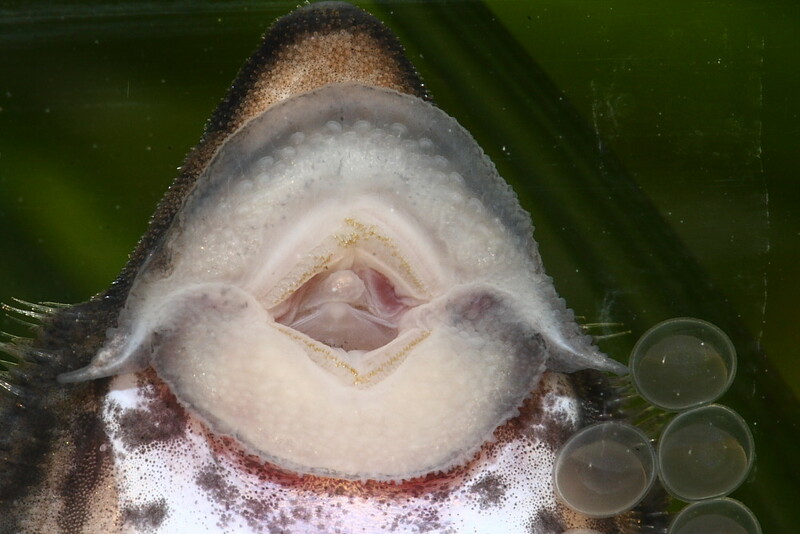 The fry will have absorbed all their yolk by then and will immediately begin seeking food. The earth worm or Spirulina sticks soften to a mush within an hour and become soft and fine enough for the fry to use their natural suction to draw fine food particles through the media bag. I place the return of a canister filter within the net breeder. I use a flared outlet that is adjustable for flow direction set to flow out horizontally. 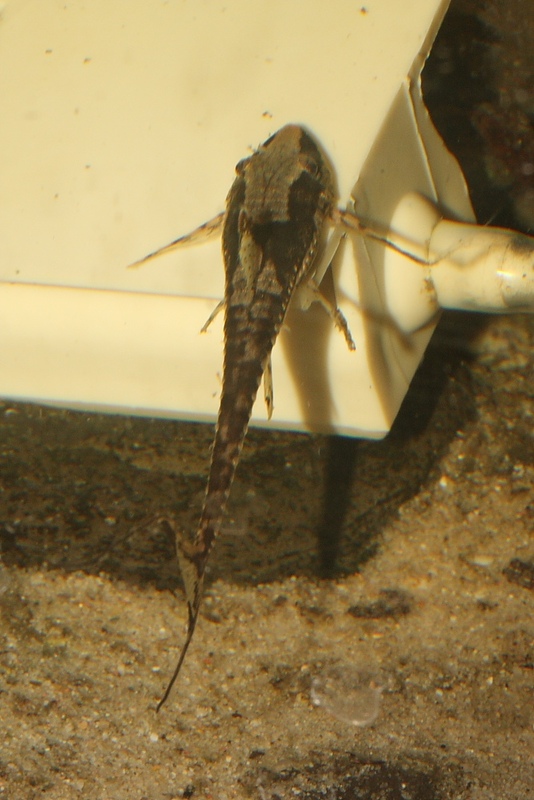 Many fry will gather along the edges of the outlet with their tails waving in the current when they are not actively feeding off the food bag. I also add just a few food sticks in the plastic jar lid as some fry will prefer feeding there as well. Several pebbles should be in the jar lid to not only hold it down but to provide resting and attachment sites for the fry. 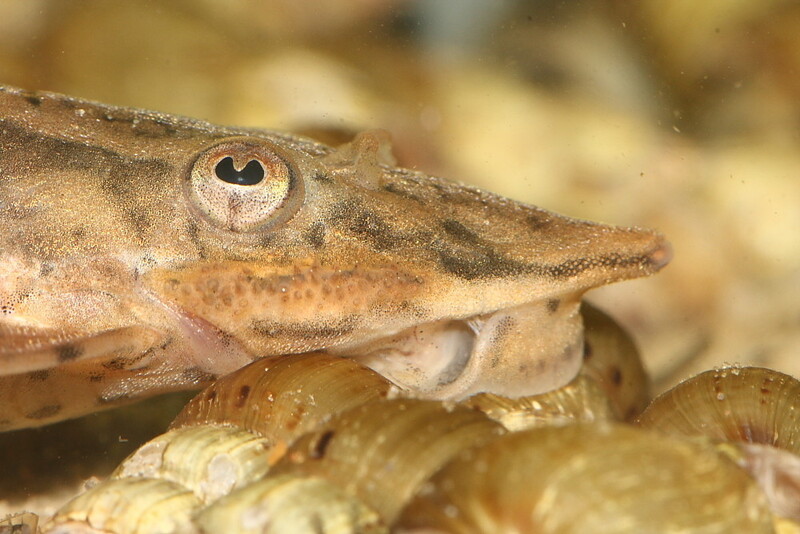 The fry may be left in the net breeder for three weeks. They feed constantly. This is an important point. Fresh food must be kept available to the fry at all times. Normally the food remains edible for about 12 hours. The food bag should be rinsed clean and restocked every 8 to 12 hours. Begin with very few food sticks as they absorb a great deal of water and expand to many times their size in the dry state. 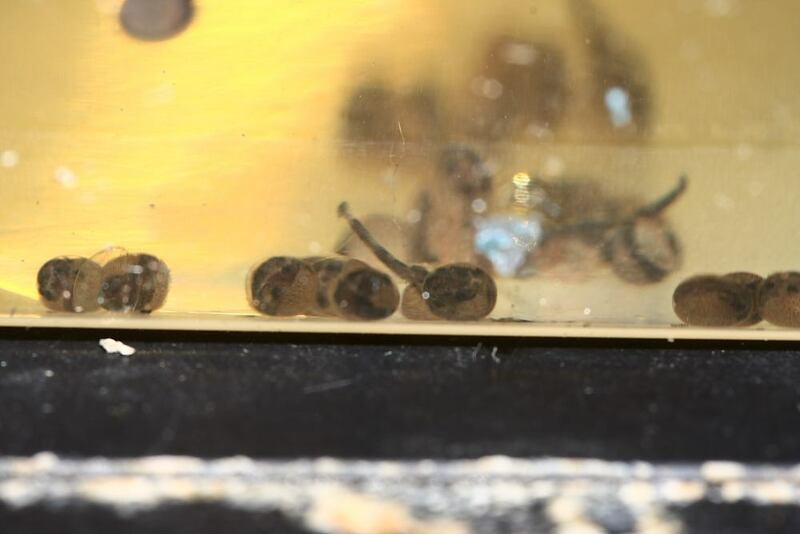 Three weeks have gone by and your Sturisoma fry should now be nearly three times as long as their newly hatched size and ready to be moved to their own first rearing tank. 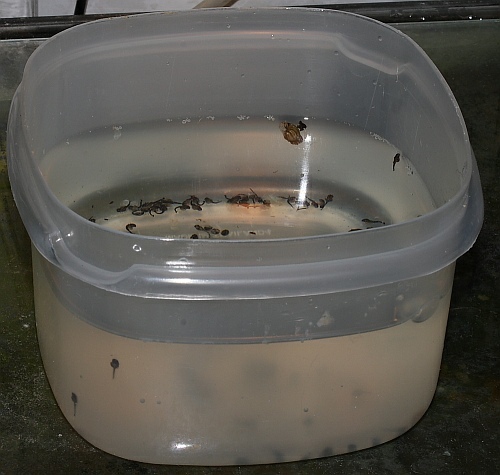 It is advisable to keep the fry concentrated in small tanks, but still necessary to move them to larger tanks as they grow. Their needs will changes as their development proceeds." Ich setze die Larven in die Breeding Box BB10 und habe nach drei Monaten eine ständig wachsende Schar, von denen insgesamt nur drei von vierzig gestorben sind - ohne die o.g. und als unerlässlich angepriesenen Earthworm Sticks! 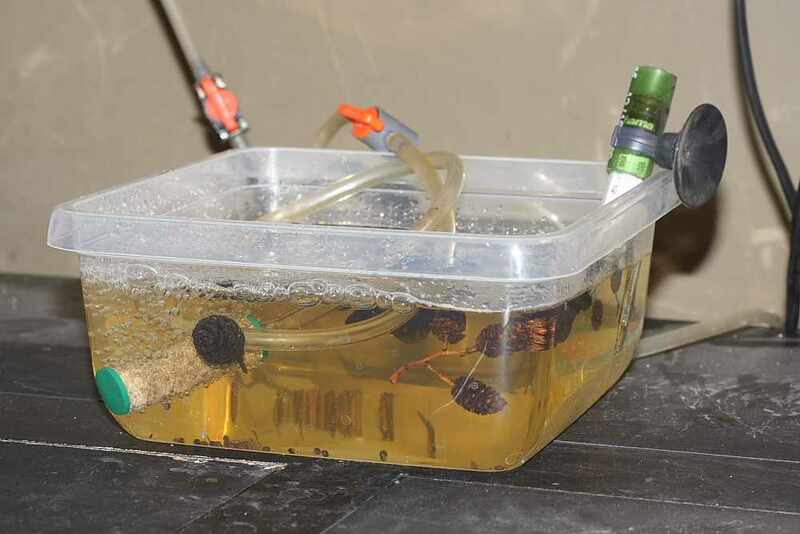 Diese BreedingBox hängt sozusagen als Rucksack an einer Seite eines Aquariums und saugt das Aquariumwasser ein, das dann an einem Überlaufgitter wieder zurück ins Mutteraquarium läuft. Dadurch sind ausreichende Filterung und Wasserbewegung gegeben. Zusätzlich steuere ich die Umwälzbewegung je nach Bedarf durch einen Sprudelstein. Sinn dieser Methode ist, dass das dargebotene Futter ständig in Bewegung bleibt und dadurch alle Larven, die nicht futtersuchend in Bewegung sind, erreicht. Wenn ich neue Larven eingesetzt habe und ca. zwei Wochen bis zur ersten Futteraufnahme vergangen sind, streue ich je nach Larvenanzahl eine kleine Menge Chlorella-Pulver in die Breeding-Box. Das Pulver löst sich sofort auf und färbt das Wasser grün. Die Larven werden dadurch - das ist meine Fantasie - alleine beim Atmen mit dieser Alge versorgt, ob sie es wollen, oder nicht. 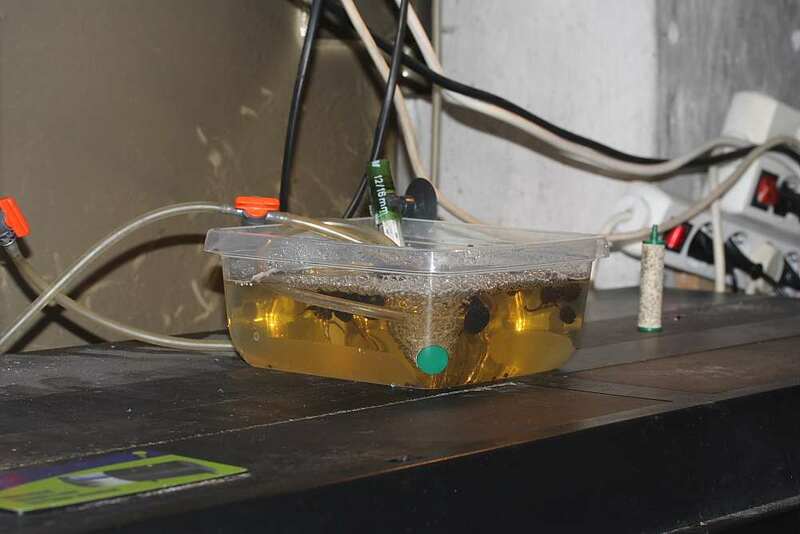 Nach kurzer Zeit ist das Wasser wieder klar, weil die Filterung Teile der Algenbrühe in das Mutteraquarium gepumpt hat. Am Boden der BreedingBox bildet sich aber nach kurzer Zeit ein Algenrasen, der im Laufe der nächsten Zeit auch die Wände hoch wächst. 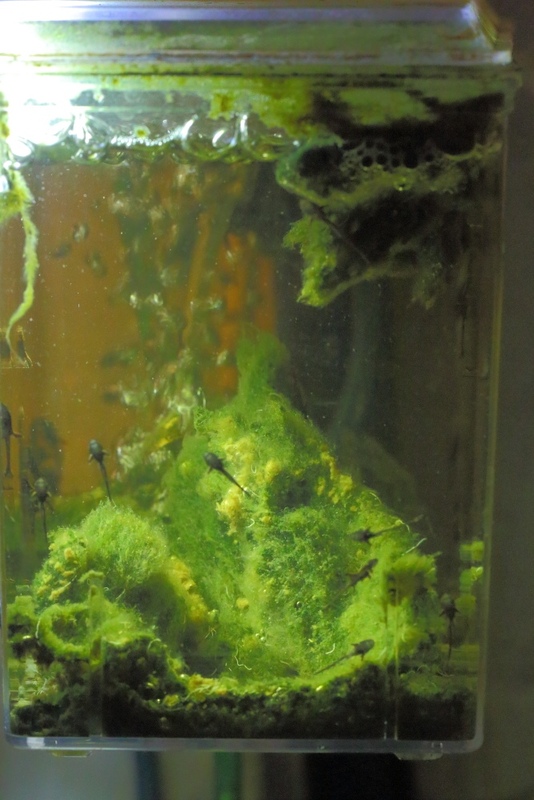 Zusätzlich zu den anfänglichen Chlorellagaben, bekommen die Larven getrocknete Artemia-Würfel, Hikari-Algae-Wafers und gefrorene Mikrowürmer, damit es eben nicht nur pflanzliche Nahrung gibt. Im Winterhalbjahr habe ich dadurch inzwischen immer mehrere Generationen dieser Art in meinen Aquarien.